The history of the Griffiths in Wales and subsequently in Yorkshire, England forms an exciting review of feudal splendor. The exploits of their sires, not the least of whom was the first Prince of Wales, paints a picture rugged as the landscape that surrounds Carnarvon Castle itself and the area of Cardigan where many members of the family chose to reside. Later generations established themselves at Burton Agnes, County York, where a magnificent manor house still stands, continuing in ownership over many generations by extended members of this family. It was here that Sir Henry Griffith was created a baronet in 1627, only a short three decades before the adventurous William Griffith, our direct immigrant ancestor, arrived in June of 1675 on American shores. 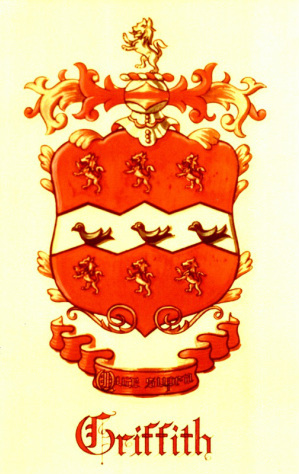 Some researchers have recently connected multiple generations of the Griffith family (from the Prince of Wales up to the 17th century) and contend that Wiliam's father returned from Yorkshire to Wales. He had possibly made a marriage of which the family did not approve and was sent back to reside with relatives. After his son, Wm. was hijacked and taken to America in 1675, it was said that word was sent to his father concerning his where abouts and telling of the fertile new lands and lack of religious prosecution. After five years the story continues that the father then sailed for Maryland, arriving in 1780 and likewise lived there until his death. Until I can prove this, it remains hypothesis. It is with William Griffith that our brief story truly begins. Some researchers say that he was born ca. 1663 which would have made him only twelve years old at the time of his passage. My own research over a period of many decades tends to indicate otherwise. That he was born ca. 1657 is far more probable, as a bible record in the possession of his grandson states that he came to America at age eighteen. According to that account he had come to London on business from his family home in Cardigan and was hijacked and put aboard a ship sailing to Maryland. Records substantiate that he is one of a passenger list of thirty-five, transported by Bernard and Stuppel for London Mariners which arrived June 18, 1675. For their services they were awarded 1750 acres (determined by the number of people whom they transported). All but five passengers were males and were required to stay a certain amount of time and to develop the land and establish a community. None were married, nor also named Griffith. It is highly unlikely that a young boy of twelve, without relatives, would have been chosen simply to increase the head count. William Griffith married Sarah Maccubin, scion of a highly aristocratic Scottish family which descended from Kenneth II and from the Highland Clan McAlpine. The Griffiths had four children. His will was probated in Annapolis Maryland Oct. 23, 1699. With my calculations he would have been aged 42 at time of death. The next in the descendant line, Orlando Griffith, like his father, was obviously a man of means. They both were Maryland planters with substantial land holdings and both married into very prestigious families. Orlando married Katherine Howard, daughter of John Howard and Katherine Greenberry, a distinguished and aristocratic families of Maryland. They descend from the Royal families of England . Count Thomas Arundel-Howard was created a Count of the Holy Roman Empire. He was elevated to the peerage in 1605 as First Baron Arundel of Wardour. His portrait by Peter Paul Rubens is in the Isabella Stewart Gardner Museum in Boston, and he is also depicted by Anthony van Dyck, in the Getty Museum in Los Angeles. It was his son, Matthew, born 1609, who migrated to America, first going to Virginia and then transferring to Maryland. Matthew was the father of John Howard whose daughter married Orlando Griffith. Thomas Howard, 2nd Duke of Norfolk, also created Earl of Surry by Edward IV in 1483, became the grandfather of both Anne Boleyn and Catherine Howard, both of whom were wives of Henry VIII. Catherine was the daughter of Edmund Howard. (son of the 2nd Duke) It was Thomas Boleyn and Elizabeth Howard (daughter of the 2nd Duke) who were the parents of Anne Boleyn, Another wife of Henry VIII, Anne Boleyn, was in turn the mother of Queen Elizabeth. Henry Griffith, the second son of Orlando Griffith, was a gentleman of substantial wealth. Like his father and grandfather, he was a prominent Maryland Planter. He was also a tobacco Inspector and a Vestryman in Queen Anne Parish, a commissioner at formation of Montgomery Co. and a Member of the Colonial Assembly. He was on the committee of Observation in 1775 and one of the assembly who formed the Association of Freemen in Maryland. He served as Justice of Montgomery Co. and helped form the State Government in 1777. He was a member of the Lower House of the Colonial Assembly for Anne Arundel Co. in 1768-70. He is handsomely depicted in a 1770 portrait by James Peale which is now owned by the Summerlee Foundation along with numerous articles of household sterling silver, all engraved with the Griffith family coat of arms. Five of The Hon. Henry Griffith’s sons were officers in the American Revolution. Rev. Alfred Griffith, the third child of Samuel Griffith and Ruth Berry was admitted to the Baltimore conference of the Methodist Episcopal Church in 1806 and remained a member until his death in 1871, a period of more than 65 years. He was Chaplain of the Senate in 1825 during the administration of James. Monroe and finished his active work in 1856 at Ryland Chapel in Washington, D.C. He was well known for his oratory and many of his published writings remain. A portrait of Rev. Alfred Griffith may be found in the State House in Maryland. There is an interesting family story related to Rev. Alfred. He stood to inherit a large amount of his family’s land in Maryland. As a minister he had become very interested in the social issues of humanity and gave numerous sermons denouncing slavery. When his inheritance came, he rejected it saying that the land which he was to inherit had been worked and maintained by slaves and as such his conscience would not let him accept it. Maryland State archival records attest to his several fervent beliefs. He was both a Greek and Latin scholar and known as “The Walking Encyclopedia”. Dr. Lycurgus Edward Griffith, son of Rev. Alfred and Catherine Schull, was an exceptional individual and scholar. He held degrees from St. John’s College in Annapolis, Md., Dixon College in Pennsylvania and Received his Medical degree from The Univ. of Maryland in 1833. Dr. Griffith’s first patient upon arriving in Texas was Sam Houston, whose leg he is credited with saving after the battle of San Jacinto. He was a thespian and a humanitarian. Dr. Griffith came to Texas in 1832(?) when it was still a Mexican province and returned permanently nine days after the battle of San Jacinto, Mar. 30,1836. He attended the wounded in San Antonio in the aftermath of the battle at the Alamo. He married Sarah Jane Clark, the Daughter of William Clark, Jr. who was a signer of the Declaration of Independence of Texas and later a State legislator. During the War between the U.S. and Mexico he was appointed as U.S. surgeon in charge of a military field hospital in San Antonio. His letters in 1846 attest to meetings with Winfield Scott and Zachary Taylor to discuss conditions of the wounded there following return of the troops from Monterrey. By 1850 he had become very successful in business and likewise owned numerous land holdings. The census for that year shows him as being worth $50,000, a sizable sum at a time when the average home with all of its contents would be valued at approximately $350. In 1857 he moved with his family to Nacogdoches where he continued to practice medicine during the Civil War and additionally he purchased a hotel there as well as the former home of Thomas J. Rusk and all of the land that ultimately would become Stephen F. Austin State University. In 1882 he and his family bought property and the following spring moved to Terrell were he became active in business and served on the first vestry of the Episcopal church. Dr. Griffith died in December of 1897 and is buried in Terrell on the Griffith family lot where five generations of the family have made their final resting place. Lycurgus Edward (Eddie) Griffith, Jr., the eighth and last child of Dr. L.E. Griffith, Sr. and his wife Sarah Jane Clark, moved to Terrell from Nacogdoches with his brother Tom at the young age of 16 to run a drug store which they eventually purchased. Griffith cousins had already moved to Terrell in the previous decade and recommended its mild climate and fertile land with plenty of water and artesian wells. The young sons soon persuaded their parents to move to Terrell where they purchased a home. Young Eddie went to Philadelphia to study pharmacy where he received a degree. Soon he bought the drug store which became The L .E. Griffith, Jr. Drug Co. Then one by one he began buying surrounding businesses. He was a remarkable business man and within a few years established and became President of the First State Bank and Chairman of the Board. (later the State National Bank) He bought the adjoining building which became a jewelry store and then another adjoining building which was to house a motion picture theater, The Palace, as it was called . Across from the pharmacy he soon bought a grocery store and an adjoining double building which became a cafe. On the other side of the grocery he purchased a small building used for shoe repair. He then went to the next block where he purchased a hardware store and tin shop. On and on it went, and business was booming. He had ranches surrounding the town and multiple rental properties in different parts of the small bustling community. He became president of the Chamber of Commerce. He was on the board of the local Toon College. An idea came along for a railroad transit system between Terrell and Dallas with commuter trains running every thirty minutes, every day. It was called the Texas Inter- urban and “Mr. Eddie” was one of the first to latch on to the new idea, where he quickly became a director. He became Grand Master of the local Masonic Lodge, a member of the Knights of Pythias, and the Elks fraternal order and was always one to “think outside of the box”, as the expression goes. He then hit upon an idea, that there should be an arboretum developed where every tree found within the broad state of Texas could be grown and observed. He first started planting and grafting pecan trees at his own grand home, but soon realized that he needed a much larger venue. He would donate the old farm back in Nacogdoches and help establish it as a college campus and adjoining park where massive pines could be grown on land which had once been the family’s corn field. He helped establish Stephen F. Austin State University and today Griffith Blvd. runs through the middle of the campus with the L.E. Griffith Bldg. on one side and the Martha T. Griffith dormitory on the other. His condition was that a “School of Forestry” must be developed. Today the school is known all over the country for its outstanding Forestry department. Ancestors of Lycurgus Edward Griffith, Jr.
1. Lycurgus Edward Griffith, Jr., born 14 Jun 1865 in Nacogdoches, Texas; died 26 Jan 1928 in Terrell, Kaufman Co., Texas. He was the son of 2. Dr. Lycurgus Edward Griffith and 3. Sarah Jane Clark. He married (1) Libbie Grinnan 28 Apr 1890. He married (2) Netta Washington Morrill 04 Jun 1904. She was born 02 Apr 1883 in Lewisburg, Conway Co., Arkansas, and died 16 Dec 1971 in Terrell, Kaufman Co., Texas. 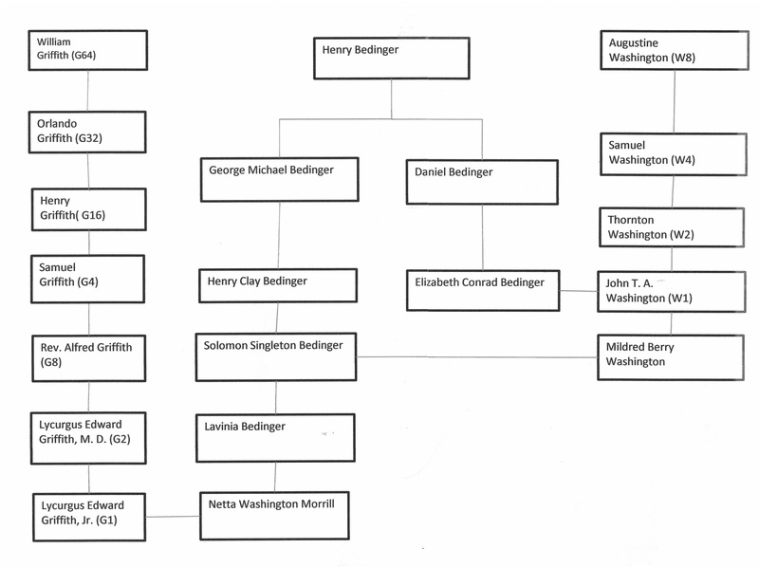 She was the daughter of Edward Henry Morrill and Lavinia Bedinger. 4. Rev. Alfred Griffith and 5. Catherin E. Schull. He married 3. Sarah Jane Clark 18 Dec 1844. 1 i. Lycurgus Edward Griffith, Jr., born 14 Jun 1865 in Nacogdoches, Texas; died 26 Jan 1928 in Terrell, Kaufman Co., Texas; married (1) Libbie Grinnan 28 Apr 1890; married (2) Netta Washington Morrill 04 Jun 1904. 4. Rev. Alfred Griffith, born 16 Mar 1783; died 15 Apr 1871. He was the son of 8. Samuel Griffith and 9. Ruth Berry. He married 5. Catherin E. Schull 30 Mar 1812. 2 i. Dr. Lycurgus Edward Griffith, born 13 Jan 1813 in Clarksburg, Maryland; died 21 Dec 1897 in Terrell, Texas; married Sarah Jane Clark 18 Dec 1844. 8. Samuel Griffith, born 1752; died 1833. He was the son of 16. Henry Griffith and 17. Elizabeth Dorsey. He married 9. Ruth Berry. 9. Ruth Berry, born 05 Mar 1762; died 23 May 1846. She was the daughter of 18. Richard Berry and 19. Sarah Dorsey. 4 i. Rev. Alfred Griffith, born 16 Mar 1783; died 15 Apr 1871; married Catherin E. Schull 30 Mar 1812. 16. Henry Griffith, born 1720; died 1794. He was the son of 32. Orlando Griffith and 33. Kathrine Howard. He married 17. Elizabeth Dorsey. 8 i. Samuel Griffith, born 1752; died 1833; married (1) Ruth Berry; married (2) Rachel Warfield. 18. Richard Berry He married 19. Sarah Dorsey. 9 i. Ruth Berry, born 05 Mar 1762; died 23 May 1846; married Samuel Griffith. 32. Orlando Griffith He was the son of 64. William Griffith and 65. Sarah Maccubin. He married 33. Kathrine Howard 06 Jun 1717 in Annapolis, Maryland. 33. Kathrine Howard She was the daughter of 66. John Howard and 67. Katherine Greenberry. 16 i. Henry Griffith, born 1720; died 1794; married (1) Elizabeth Dorsey; married (2) Ruth Hammond. 64. William Griffith, born Abt. 1657. He married 65. Sarah Maccubin. 65. Sarah Maccubin She was the daughter of 130. John Maccubbin and 131. Elinor Unknown. 32 i. Orlando Griffith, married Kathrine Howard 06 Jun 1717 in Annapolis, Maryland. 66. John Howard He married 67. Katherine Greenberry. 33 i. Kathrine Howard, married Orlando Griffith 06 Jun 1717 in Annapolis, Maryland. 130. John Maccubbin He married 131. Elinor Unknown. 65 i. Sarah Maccubin, married William Griffith.